Back in 1912, the world was a very different place. Even though it was the 12th year of the 20th century, there was still of naivety that made it still seem like the 1800s. Mankind was changing, and things like automobiles were starting to be produced, and things were beginning to prosper like never before. This time period was known as the Guilded Age because everything seemed so perfect that any kind of tragedy or disaster was completely unheard of. Also at this time, the shipping world was changing too, and now ships were not just trying to cross the Atlantic as quickly as they could, but were now trying to do it with a lot of luxury. 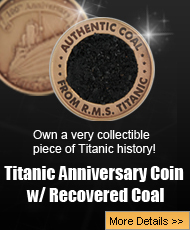 When the RMS Titanic was being built, the world was waiting because everyone wanted to get on board her. However, little did the world know that the launching of the world’s biggest ship would change the world forever, and suddenly turned this naive time into the 20th century literally overnight. Everyone wants to know what happened when the RMS Titanic went down. 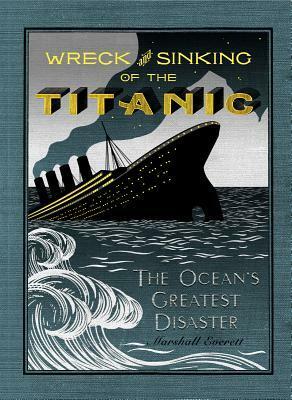 One of the first books that was ever published about the disaster. It was honestly amazing that Marshall Everett was able to gather the data that he did in order to publish such a thorough book about what happened that terrible night. 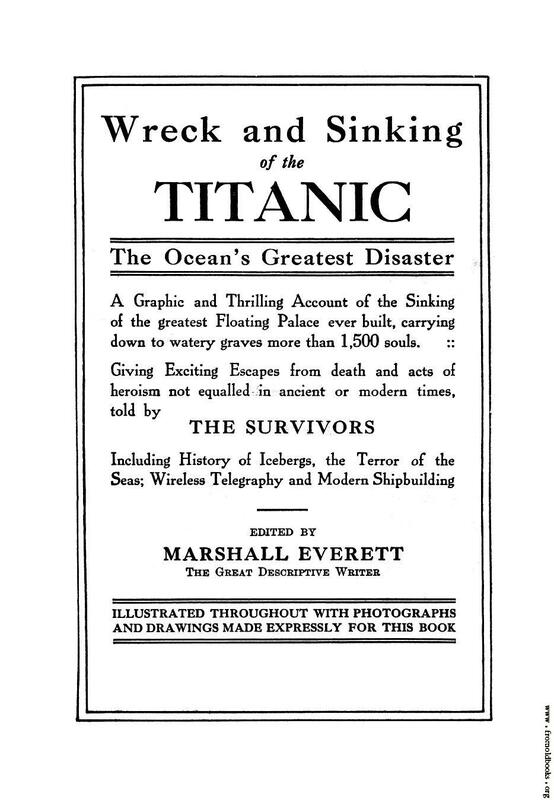 The book is divided up into chapters, and each one has a lot of information about the story of the Titanic, plus other information like what it was like for the survivors, and where they were when the mighty ship struck the iceberg. Everett was able to speak to some of the survivors such as Lawrence Beesley, Colonel Archibald Gracie, and many other survivors. Also, Everett included what happened to the survivors once they got home, and includes information about the Senate investigation into the disaster. However, there are some very notable chapters in this book that are going to take people back to the terrible night, and right on the deck of the unsinkable ship. This is just one part of the third chapter of Marshall Everett’s book, and for those Titanic historians that want to read information about the disaster when it was still fresh from the witnesses and survivor’s minds, then the Wreck & Sinking of the Titanic book is one that needs to be added to their collections. 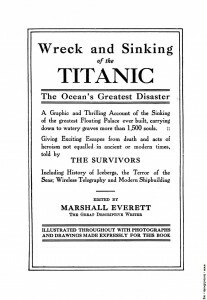 The disaster is seen through the eyes of some of the survivors, and it really does take readers bck to that horrible night in a way that no other book on the Titanic can.